Great achievements in football often become more incredible once the dust is allowed to settle. There were several feats around Europe last season that will no doubt be looked back on as a great year for the sport. We have already looked at the way Athletic Bilbao delighted world audiences to reach two cup finals, but there were also memorable scenes in Italy as Juventus went a season unbeaten to win Serie A in their first year at their new stadium. In Germany, Borussia Dortmund won the Double with a young and exciting group of players overcoming the might of Bayern Munich. Even in England, Manchester City sealed the Premier League title in dramatic style on the last day of the season. However, it was arguably the goings-on in the French Ligue 1 that were the most surprising. Montpellier HSC, a relatively inauspicious club from the south of France, won their first title. For football purists across the Continent, it was a refreshing sight to see Montpellier finish ahead of the gas-rich Paris Saint-Germain, as well as the traditional French powerhouses of Lyon and Marseille. Manager René Girard had taken a team of players who were more or less unheard of, and on a budget a fraction of their rivals, transformed them into a title-winning side. Travelling to Montpellier for Arsenal’s first Champions League game was a great opportunity to see how the city is reacting to life as the French Champions. As far as the team are concerned domestically, there appears to be somewhat of a ‘second season syndrome’ setting in; sitting 16th in the table, Montpellier have won one game in six and conceded nine goals. But the supporters remain in good spirits. Speaking to them before the match, they were simply happy that the world had now heard of Montpellier and its football club. T-shirts with the slogan ‘Champions de France 2012’ were popular around town and the team colours of blue and orange were often on display. 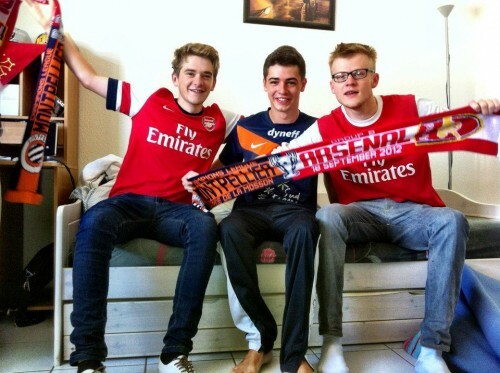 Over the summer, Arsenal were perhaps the main beneficiaries from Montpellier’s success. They signed French striker Olivier Giroud for £12 million. Giroud was Ligue 1’s top goalscorer last year with 21 goals and he was certainly a talisman in their Title victory. While the Frenchman has struggled to get off the mark at his new club, his great workrate, his strength in the air and perhaps his rather handsome Gallic appearance have made him a popular fan favourite. He got a good reception from both sets of supporters at the Stade de la Mosson last week, with the home fans enjoying the Gunners’ new chant to the tune of ‘Hey Jude’ (“Na na na na, Gi-roud!”). Such mutual appreciation was really refreshing to see. The past fortnight in English football has been marred by the re-emergence of the old rivalry between Liverpool and Manchester United, with a minority of fans singing disgraceful chants about the Munich Air Disaster and Hillsborough. Furthermore, European away trips have often ended in tragedy for travelling English fans. Over the years there have been terrible incidents, particularly in Turkey and Italy. France is no stranger to fan violence either. Two years ago, a PSG fan was killed in a clash with Marseille supporters before the clubs contested ‘Le Classique’, France’s fiercest rivalry. Along with Lyon and Saint-Etienne, they boast significant Ultras group. In Montpellier however, such groups do not exist on the same level. Until last year, they had never troubled the upper echelons of Ligue 1. Instead, the club have traditionally viewed the nearby city of Nîmes as its rival. That Montpellier should win their first title whilst ‘les Nîmois’ were in Ligue 2 must have been a particular source of satisfaction. Of course there was certainly a fantastic atmosphere on Tuesday night’s match against Arsenal. A local paper had greeted the Arsenal manager’s return to his homeland with the headline “Welcome to hell Arsène!”, while Girard had urged the 30,000-strong crowd to be supporters rather than spectators. And the fans duly delivered. The 90 minutes were intense and the support spurred on the home side, who probably deserved at least a point after a dominant second half display. Both sets of fans had been terrific all game and after the final whistle they applauded each other. This is how every football match should end. During the game it can be intense and passionate, but once it is over fans should walk side by side. Indeed, in Montpellier there were offers to go for a drink which we gladly accepted. It was a chance to exchange stories and past experiences. This was a rare glimpse of fan harmony at high level football, coupled with a strong shared appreciation for the respective achievements of Montpellier and Arsenal. By its very nature as a competitive sport, football can create hostility and tribalism. But ultimately, football fans should all go to games for the same reason: to support their club. Montpellier’s success on the pitch should serve as an inspiration to other clubs; but we as football fans can also learn a lot from their welcoming group of supporters. This entry was posted in Reports and tagged arsenal, arsene wenger, france, gooners, ligue 1, lyon, marseilles, montpellier, olivier giroud, psg by Hugo Greenhalgh. Bookmark the permalink.